10 Now the priests who carried the ark remained standing in the middle of the Jordan until everything the Lord had commanded Joshua was done by the people, just as Moses had directed Joshua. The people hurried over, 11 and as soon as all of them had crossed, the ark of the Lord and the priests came to the other side while the people watched. 12 The men of Reuben, Gad and the half-tribe of Manasseh crossed over, armed, in front of the Israelites, as Moses had directed them. 13 About forty thousand armed for battle crossed over before the Lord to the plains of Jericho for war. 14 That day the Lord exalted Joshua in the sight of all Israel; and they revered him all the days of his life, just as they had revered Moses. Light comes from the sun, high & to the left of the scene. 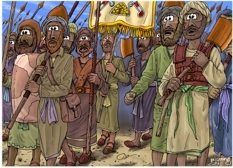 Various Hebrew soldiers from the two & a half tribes of Reuben, Gad and the half-tribe of Manasseh, marching over the ground into the Promised land. 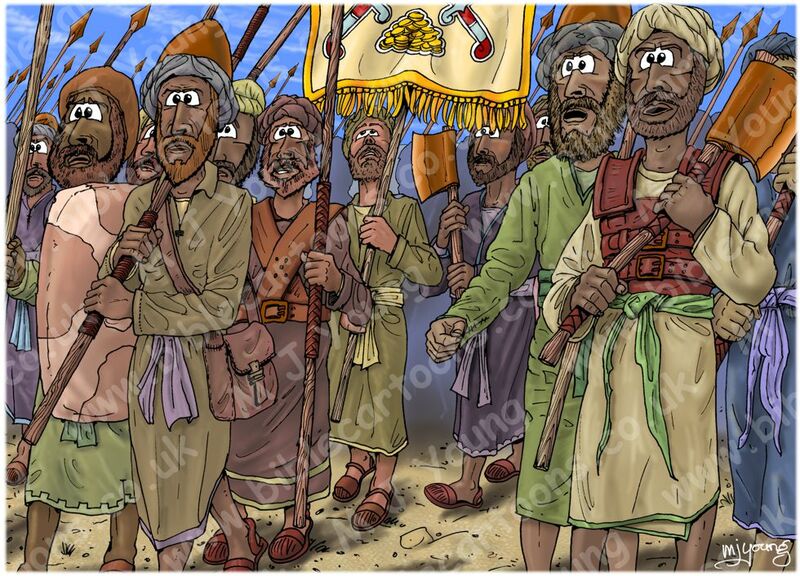 This scene represents the 40,000 armed men, ready for battle, who went in front of the Hebrew people into the Promised land. You can see the lower half of a yellow/gold banner of the tribe of Gad. Click here to read the article which describes how I designed the 12 tribal banners.